Sales, Poll Results, and More! This is our first issue of our newsletter! We hope it is both informative and something looked forward to each month by our subscribers. We have some fun and exciting new additions to our website. One of which you are reading right now! This newsletter (a.k.a. e-zine) will be a great way for us to send you the latest on all the goings on here at Phyllis Jean. As a perk we will be sure to send you special offers just for subscribing! The other new addition is our blog. Each time I update pages or add something new it will be put on our blog...that is the goal at least. If you are unfamiliar with blogs, how to subscribe, etc. don't worry! They are something rather new. The RSS box on the left hand side of our website has a little blue question mark. Click on it and read all about RSS and blogging. It is another great way to keep in touch with us and our website. Here is a quick quote from the article explaining RSS blogging: "Once you get started, it's like having your favorite parts of the Web come to you. No need to go out and check for updates all the time. No need for bookmarks! "RSS" means "Really Simple Syndication." But that's just a fancy way of saying that you can keep up with all the updates to www.phyllisjean.net without having to check the site every week to see "what's new." New pages and updates to old ones are released through RSS." Once you head over to our store and select the items you want simply checkout as you usually would. The first screen that appears asks you whether you are a new customer, returning, or want to check out without creating an account. Once you click the appropriate button, the screen will expand and that is where you put in the promo code. Please remember to enter it in. We want you to save some money! We had a suggestion to put the prices where the images are located on our website. I think that is a great idea and I will be working on getting that up on the website this month. As for now, you will have to go over to the store to find the prices for the particular item. Okay, here we go! The April Poll Results Are In! How are our prices...Way too high! 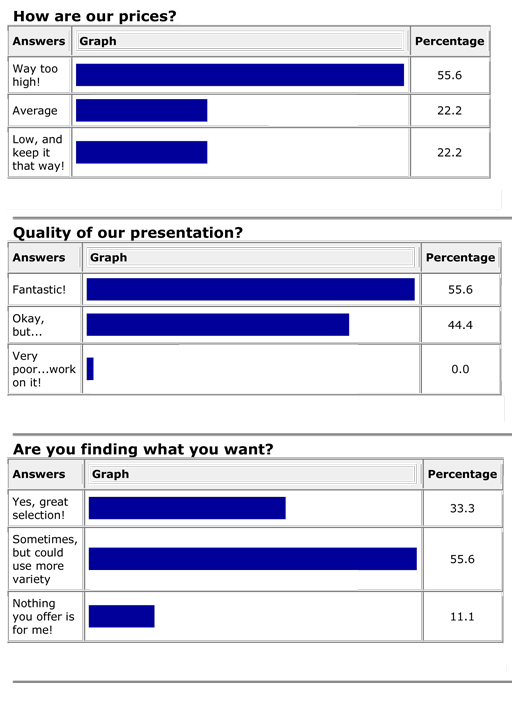 First of all, thank you for the high percentage of people who thought our presentation is Fantastic! We are really trying hard to make it enjoyable. With regards to our variety, we plan on making more options as time permits. Hang in there though, they will come. We were a little surprised at this result so we thought we would take the rest of this newsletter explaining the prices, and a little background on our products as well. We offer clothes that are scarcely available on the market today. We use quality fabrics for our detailed and labor intensive garments. Our ladies blouse pattern has traditional princess seams, a rounded collar, and buttons every two inches. This was our pattern design for you and us, a modest blouse you can feel comfortable wearing! All these little details take time and are more costly than just two pieces fabric sewn together. Once you wear them you will love the difference! Our skirts are also a more detailed piece of clothing. We are so happy to offer you our ten gore skirt. What is that? Well it is ten pieces of fabric some wider than others and it drapes so nicely. The skirt is full enough to keep you covered up while you move. No more sewing up slits and tugging here and there to make sure you are covered. We plan on having this skirt available in a few different colors and fabrics. Our clothes are cut and sewn here in the US. We are trying to pay our workers fair wages, and to keep jobs in our own country. This is a family run business. The “employees” are mostly volunteering their time until the business gets on its feet. After shopping with us you can say goodbye to long tiring trips to the mall. You can clean out your closet of clothes you never really liked, but hung onto because they met the right length requirement. Our return policy is wonderful. If you are not happy with any of our clothes, return them in the same condition you received them in for a full refund or exchange. So after reading all of that here’s the news you have been waiting for. To all of our newsletter subscribers....enter the promo code “skirts” into the appropriate place on our store and get 25% off your entire order. We look forward to helping you build your new wardrobe! Just in time for summer.